Hot on the heals of my last blog about oats, gluten and allergen labelling I had a look at some of the oat based products in my larder and others online. It would seem that there is a split in the market. Many companies are labelling oats in bold but just as many are not. Of the products I buy and had in the house none had oats labelling in bold, including the Nairns and Provitamil oat drink. So are they wrong? Are both ways of labelling correct? And if they tell us whether the oats are gluten and wheat free or not does it even really matter anyway? It would seem that companies making oat based products should all be stating the oats in bold. I will be writing to the companies here who haven’t with a link to this blog so they can investigate accordingly. I am still slightly confused about what is best but since I don’t have to worry about oats as such, just the wheat contamination, all I want to know is that products are gluten free or wheat free, which are not always the same thing. Gluten free products can have de-glutenised wheat added back in – not great if you react to other parts of wheat. Nairns don’t label their oat based products with oats in bold. However they do specify when gluten free oats are used on the pack and warn customers that oats do contain the protein avenin which can cause an allergic reaction. I also love their nut warnings. 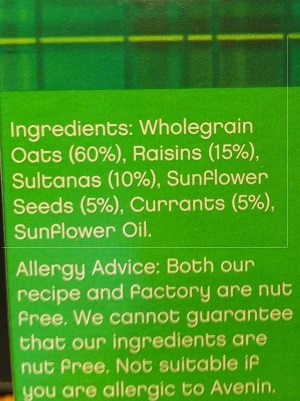 By stating that the factory and product is nut free I feel safe to eat this product. They cannot declare the products ‘nut free’ without this proviso. 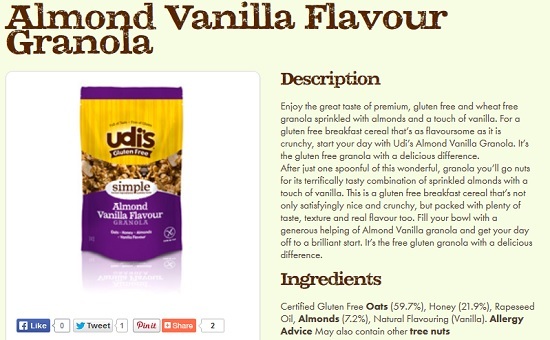 Udi’s gluten free products do show oats in bold on all their oat based products. 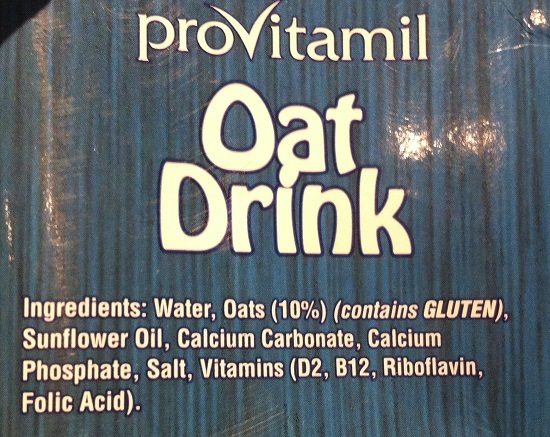 Provitamil don’t label oats in bold but they do bold the word gluten in the (contains GLUTEN) warning. It’s not clear whether this means the oats may contain wheat or just avenin naturally occurring in the oats but I have been enjoying this milk on my cereal with with no adverse effects so I’m pretty certain it is wheat free! Bob’s Red Mill Apple and Blueberry Granola, also don’t label the oats in bold but do state that the product is wheat and gluten free. e.g. Ingredients: Whole Grain Rolled Oats, Cane Sugar, Brown Rice, Mixed Fruit Blend Concentrate (Pineapple, Pear, Peach), Unsulphured Dried Apples, Brown Rice Syrup, Natural Blueberry Flavor, Blueberry Concentrate, Vitamin E.
Oatly don’t label their oats in bold either – another product you’ll find in my larder. Now I feel like it’s somehow my fault… all the oat based products I have in my house are not showing oats in bold… hence my confusion on the whole subject I’m guessing. I would kind of assume the companies making these products would understand more about their labelling than a very humble blogger. I look at just six products and out of the six, only two of the companies were stating oats in bold, these were Sainsbury’s and Udi’s gluten free. All the rest were not showing oats in bold or were showing gluten in bold, which is also technically incorrect. But does it really matter? All these companies make great products which make our allergic lives so much easier. We applaud them all for that. Maybe they’re using up old packaging and will update their labelling soon or maybe they didn’t understand this oaty issue either. It’s good to know that I am not alone in being confused about the oat labelling. Do you have any oat based products at home in your larder? Do they show oats in bold?